“A haunting story about the long reach of the past." “A graceful and ominous family history." “In this intriguing book, [Nordhaus] shares her journey to discover who her immigrant ancestor really was — and what strange alchemy made the idea of her linger long after she was gone." After a year and a half of talking, reporting, marching, conference-calling, driving, hiking, biking, horse-riding, writing, editing, agonizing, factchecking, more editing, more agonizing, more factchecking, two features I wrote ran in this month’s National Geographic magazine. The cover story tells the story of the battle over public lands in the American West. A second story tells of how the sage grouse, a struggling species found only in the “sagebrush sea” region (with the most outlandish mating ritual you’ll ever see, besides, well, humans), has exacerbated conflicts over land use and environmental protection in the west. Last summer I spent two humid sunsets in a cornfield in Illinois, learning about the corn rootworm–which is not actually a worm, but rather a beetle. It is the most consequential pest in American agriculture. Known as the “billion dollar bug,” its cost to corn growers is estimated at somewhere just shy of 2 billion dollars, including research into GM crops that have kept the pest under control for a decade, but now are starting to fail. It’s an constant evolutionary battle between farmer, beetle and the ag company scientists trying to help farmers fight it off. The beetle has developed resistance to every pesticide farmers have thrown its way–and even to age-old agricultural practices like crop rotation as well. Joe Spencer, an entomologist who has devoted his career to studying the bug and is known to his colleagues at the Illinois Natural History Survey, affectionately, as “Cornboy,” gave me a tour of the world of the rootworm, and I wrote about it in Scientific American’s March 2017 issue. I have never seen more corn in my life. I write in this month’s Smithsonian Magazine about Sister Blandina Segale, the intrepid nun who founded hospitals and schools in 19th century New Mexico, and is now being considered by the Vatican for sainthood (and who saved my great-great-grandfather from Billy the Kid). I spent some time with the man who is championing her cause, and the detective involved in Sister Blandina’s very belated background check. There was a massive learning curve (RNAi anyone? ), a lemon-soda-fried motherboard (second brand-new computer in two weeks), a back-up fail (lost reporting notes, yay), a kill fee, a resurrection, too many rewrites to count and some very odd photos involving honey and a pane of glass–but a year and a half later, this story about bees, mites, Monsanto, the culture wars, and one dogged apiarist finally sees the light of day in Wired Magazine. American Ghost has won the Creative Nonfiction category of the WILLA Literary Awards. The award will be presented at Women Writing the West’s annual conference in Santa Fe, October 13-16 at the Drury Inn on the Plaza, just across the street from Julia Staab’s home. 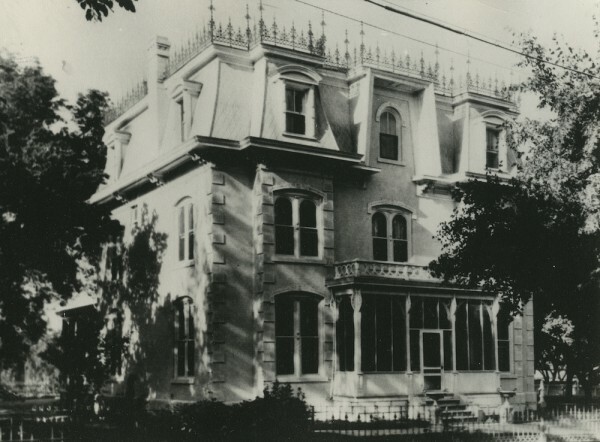 La Posada will offer tours of the home from 2-3 on Thursday, October 13. American Ghost is co-winner of the Seven Sisters Book Awards in the nonfiction category. The Seven Sisters prize is a brand new awards program honoring women’s stories and women authors. I had always hoped that when the book came out, I’d gather more information about Julia’s life and family — tidbits that were hidden in family keepsake books or photo albums. I also was curious whether people continued to have encounters with the ghost of La Posada. Now I am beginning to hear some of those stories, and I’ve created a new blog on my website to share them as they come in. Here comes Halloween: Buzzfeed gets spooky. I wish I had this list of ghost books when I started research on American Ghost — read some of them, but missed a number. 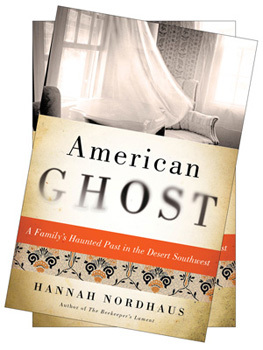 Coming in March to a bookstore near you, the American Ghost paperback! The idea being to emphasize that this is a history book, not a paranormal potboiler. Fun as those are to read, some people get really pissed when they find out they’ve been duped into reading a history book instead…. The Smiths onian/Zócalo Public Square asked me to write an essay about Julia Staab for their “What It Means to Be American Project.” I wrote about how Julia Staab became American in the unforgiving desert of New Mexico–whether she wished for that life of not, she had no choice. Last week, I sat down with Ryan Warner, host of Colorado Matters, to discuss American Ghost, Julia Staab, the Santa Fe Trail, 19th-century gynecological care, and the fine line between history and lore. You can listen to the interview here. What? You can’t wait until March 10 to see what American Ghost is all about? Lucky for you! My publisher, HarperCollins, has posted the book’s first chapter on Scribd. You can read it here. American Ghost in EW’s 2015 Preview Issue!